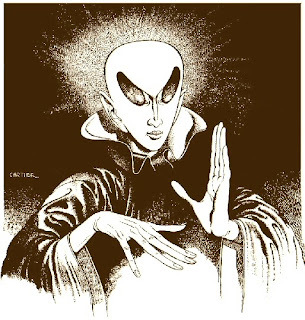 The now-ubiquitous image of the "Gray" alien (or Zeta Reticulan) really only dates from the 1960s, when the whole Alien Abduction phenomenon was initiated by the Betty and Barney Hill case. Before that time, extraterrestrial visitors (both in fiction and, um, reality) tended to come in a wide variety of shapes and sizes... with Gray-like entities being very rare indeed. The picture on the left, drawn by Edd Cartier for the August 1941 issue of Unknown Worlds magazine, is one of the few pre-1960s Gray-like images I've come across. It's taken from Henry Kuttner's short story "The Devil We Know" ("The face was thin, with pale, translucent skin of finest ivory, and it was completely hairless. It was triangular, delicately wedge-shaped, without cheekbones. The eyes were certainly inhuman. They slanted up almost to where the hairline would have been, and were like cloudy grey-green stone".). Does this prove that the Zeta Reticulan visual meme was around in the 1940s? Well, no it doesn't. The picture isn't meant to be an alien at all -- it's the demon Azazel!